Andrew Taylor was not happy how he looks. He was a fat guy and wanted somehow to help himself. He fell down and depressed, drinking medications, but it did not help him. He ate everything. He became really addicted and ate everything he got – fried greasy foods, ice creams, cakes, chocolates, pizza and drinking too much soda. “I realized that I was addicted. When you are an alcoholic and you become aware of that, you want to stop drinking. It is the same when you want to stop eating junkie food. But you cannot stop eating. I realized I had to do something, “he said for the Austrlian portal news.com. 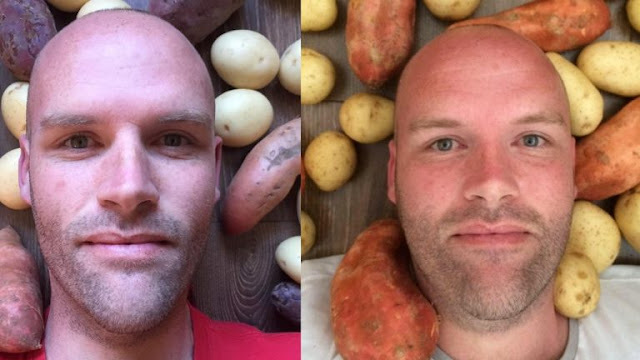 He decided to make a radical change – to eat only potatoes. Many were skeptical, many criticized him, tried to dissuade him from this idea. But Andrew was persistent, overcame it all and has lost up to 50 pounds for less than a year! “I suffered from clinical depression and potatoes helped me to deal with it. I do not drink antidepressants, sleep better, and even more do not feel pain in joints I sustained playing football ten years ago, “said the Australian, who even made a business out of this, and called it” Spud Fit Challenge “. He admitted that it is the beginning of this diet was hard, real torture. But it is easier lately. “I just stopped thinking about any other food,” he explains. He has become a real star in the Australian media.